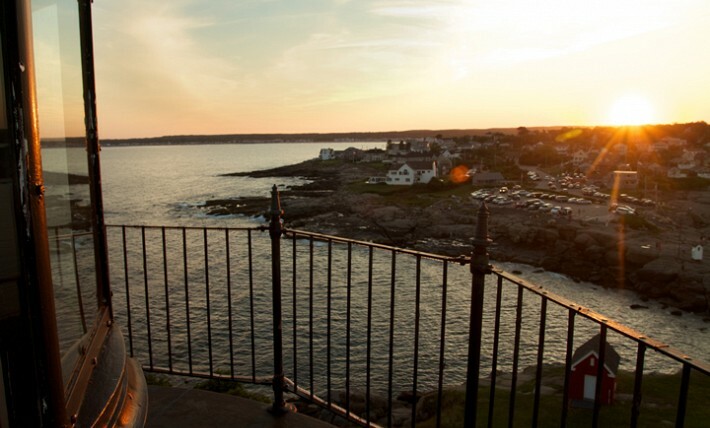 What excitement to see a multitude of visitors arrive daily to view our beautiful coastal shores and to capture the view of our majestic beacon Nubble Lighthouse. How did we arrive at this beautiful park and own this gorgeous beacon of light? In colonial days mariner traffic was important to the commerce of the area. Knowing that Maine’s rocky coast was very dangerous to those mariners and their livelihood, the Citizens petitioned the United States Government for a lighthouse. In 1874 President Rutherford B. Hayes appropriated the sum of $15,000 to build a lighthouse on this “Nub” of land. On July 1, 1879 construction was completed on what, at the time, was known as the Knubble Lighthouse with a 4th order light began to protect our men and women on the sea. The men and women serving in the Lighthouse Service were the first guardians who provided great care for the light and its surrounding buildings. Once the Lighthouse Service completed their work, the United States government transferred this valuable service to the U.S. Coast Guard in 1939. They gave Nubble Light the official name of Cape Neddick Lightstation. The Coast Guard and their families were wonderful caretakers of our Maine Lighthouses. Eventually this service became short of resources and funding to care for our majestic beacons. Because of this in part, as well as the growing development of technology, the Lighthouses became automated. Nubble Light was automated in July, 1987. As the last service man from our Coast Guard and his family left their home on the island, the future of the buildings and the beauty of the island were left in question. In order to insure the protection of our valuable Maine treasure, Nubble Lighthouse was placed on the National Register of Historic Places to preserve and protect its historical presence in history. This is overseen by the United States Secretary of the Interior and the State of Maine’s Historic Preservation Office. In addition, a lease agreement was signed in 1987 between the United States government and the Town of York to ensure that the property would be maintained and cared for. The Maine Lights program was developed in 1994 specifically to save all of Maine’s lighthouses along our coast. Out of this agreement came the application and evaluation process to find a new and permanent guardian for our lighthouse. The Town of York, with great concern for the significance of the Lighthouse to our town and its people and facing competition for ownership of Nubble, formed a committee to represent its best interests in a lengthy process of acquiring the lighthouse through action of the Congress of the United States. On December 18, 1997 the announcement came from the office of Senator Olympia Snow that, based on its strong application, The Town of York Maine was, and will continue to be, the permanent guardian for Nubble Lighthouse (Cape Neddick Light Station). And today in 2012, the daily work of maintenance for our Nubble Lighthouse is under the Parks Department who care for our property and our buildings on a daily basis. The United States Coast Guard will continue to maintain the aids to navigation (the Light and the Horn). The Town of York has an awesome endeavor and tremendous responsibility. We have developed a financial and maintenance plan. From Sohier Park, donated to the town by the Sohier-Davis Family, our visitors can enjoy a magnificent, close-up view of the lighthouse. Through the kindness of the Town, the continued hard work of the staff of the Parks and Recreation Department, and most especially the diligence of countless volunteers we have been able to build a Welcome Center through which we can raise the necessary funds to maintain the beauty of both the park and the island. The planned expansion of the Welcome Center will provide even further for the comfort of our visitors and the funds needed to continually beautify our town’s gem. We, in turn, promise you that we shall continue to honor the promises we made in the application of ownership: to preserve the historical, protect the wildlife and maintain and execute a financial plan to care for the lighthouse well into the future.